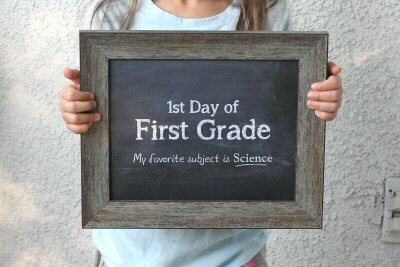 I made a cardinal mistake when photographic my kids with their first day of school signs: no practice run. The issue this time wasn’t incorrect camera settings, it was all the other things I couldn’t control. I was expecting an overcast sky like last year for a nice soft look, or at least a sun at a favorable angle. Instead I had full sun and harsh light. Lack of solid sleeping combined with over excitement made it difficult for the kids to sit still. The sun wasn’t right, and the mood wasn’t right. As a result, the picture wasn’t right. I do have many funny outtakes, though, including Alexis holding standing in profile with her sign as though it’s a mug shot. There’s a trade off between the idealized and authentic in photography and I definitely err on the side of idealized. When I look back at the year’s photos, I’m happier seeing the best ones, than the most authentic ones. It doesn’t bother me if a photo is a staged recreation, or taken a few days early or late. To be honest, I usually don’t remember those details anyway. It does bother me if the photo is technically flawed. It does bother me if, when I see the photo, my first thought is how I should have or wish I had taken it. What I should have done was taken a few practice photos with our “first day of school” sign the weekend before, when we weren’t under a time constraint. If the lighting was bad that day, or the girls just weren’t in the mood, we’d be no worse off. On the other hand, if we ended up with a great photo I’d have a back-up shot I could potentially use for my highlight reel if need be. True, it wouldn’t be authentic, but it would have taken the pressure off on the actual first day of school. Rather than practice shots this time, however, I did “retakes” a few days later which ended up much better. It was too late for my highlight reel this time, but at least I have them.